Chef Rizwan Ahmed was one of the generous chefs who provided a seafood dish for our first annual fundraiser sail on the Schooner Aurora on October 6, 2013. He was also generous enough to share with us his special recipe for Soupe de Poisson! This recipe utilizes the leftovers remaining after fish fillets have been cut and used for another dish. It works with any whitefish. According to Riz, this Soupe de Poisson is is typical of Provence. Fishermen in that region typically reserve a few of the best fish from their catch for their family and friends before. We procured the fish bones from Gabe the Fish Babe, a Point-Judith based seafood start-up specializing in lesser known niche species bought straight from the boats. Gabe and her staff we busy filleting hake when we arrived, so we grabbed a few racks and drove over to Bristol, where we delivered them to Chef Riz at the Hourglass Brasserie. Riz was delighted with the hake. He said it was ideal for this kind of preparation. 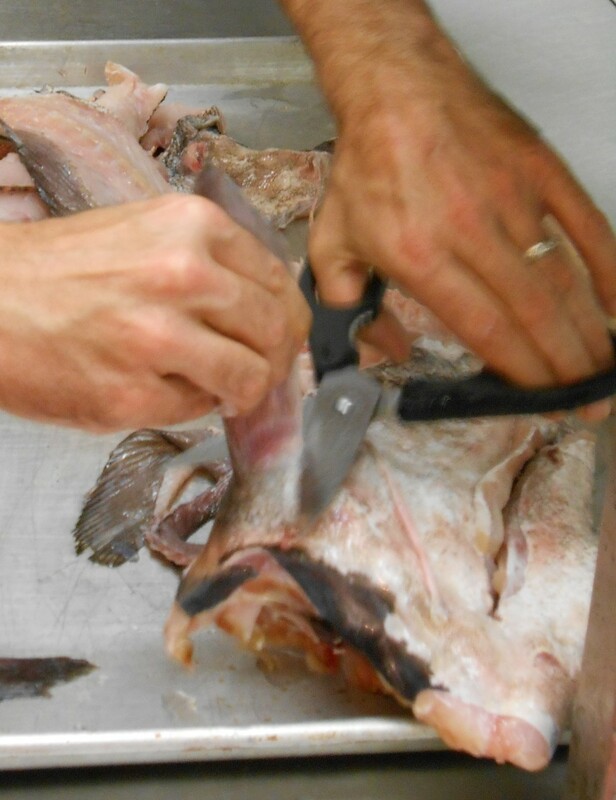 Riz' first step was to trim off the heads, fins, and tails of the fish, using scissors. If you skip this step, the soupe will have a sour taste. Then, Riz cut the fish bones into large chunks with scissors. You can also hack it into chunks with a large knife. Chopping the fish increases the amount of surface area, so that the flavor seeps out into the stock better. Riz then soaked the fish chunks in cold water for two hours, changing the water two or three times, to bleach the blood out. Adding salt to the water helps, and some chefs add a bit of lemon juice as well. Next, Riz made the fish stock. To make the fish stock, put the fish chunks in a pan with onion, fennel, garlic, celery, a bay leaf, thyme, lemon juice, and white peppercorn. Cover with water. Boil and then simmer for 40 minutes. Then skim off the impurities. The stock can be kept in the fridge for up to one day. The next part gets a little confusing, because it involves a lot of the same ingredients and process that we just went through. Roughly chop onions and fennel (with fronds still on). Put in a stock pot with hot olive oil on medium-high heat. Add salt, fennel seed, bay leaf, coriander, smashed garlic (smashing releases the oils better than chopping). Zest oranges and add to stock. Simmer for a few minutes. Cut oranges in half and use a reamer to juice them into the stock pot. Some people also add in saffron, but it can be pricey. Add pureed tomatoes. Add the fish stock made previously. Simmer 40 minutes, then puree and strain. The soupe is now ready to serve! Chef Riz recommends serving the soupe with a rouilee (somewhat like mayonnaise; made with garlic, egg yolk, and roasted red peppers) spread over crostini, floating in the bowl.